"Family friends" of Texas Attorney General Ken Paxton are continuing to pour hundreds of thousands of dollars into his effort to fight securities fraud charges. 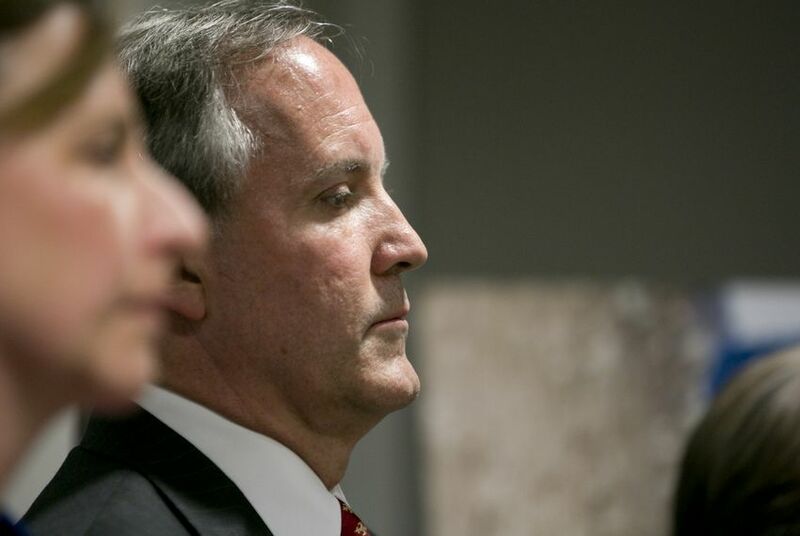 Texas Attorney General Ken Paxton, nearly two years into his fight against state securities fraud charges, is continuing to get plenty of help from his friends to cover his soaring legal bills. The Republican accepted nearly $218,000 in 2016 earmarked for his legal defense from “family friends” and others whom Paxton says are exempted from state bribery laws that bar elected officials from receiving gifts from parties subject to their authority, according to a newly-released financial disclosure statement. Those donations are on top of more than $329,000 Paxton accepted for the same cause in 2015. Steven and Carrie Parsons of Dallas made last year’s biggest contribution, $75,000. They have also donated thousands of dollars to Paxton’s political campaign. Alfred and Janet Gleason of Green Valley, Ariz., made the second-biggest legal fund donation in 2016: $50,000, according to the filing. Ray and Ann Huffines also gave Paxton $10,000. Ray's brother is state Sen. Don Huffines, R-Dallas. As attorney general, Paxton's authority could extend broadly, so in his disclosure he cited an "independent relationship" exception for most of the contributions that allows gifts from family members and those "independent" of an officeholder's "official status." Paxton said another part of the legal code allowed him to accept two gifts from out-of-state donors. “All gifts for legal defense were conferred and accepted on account of a personal, professional, or business relationship independent of General Paxton's official status,” Paxton’s disclosure form states. In all, 15 people or couples chipped in for Paxton’s legal defense last year. And one entity called Annual Fund Inc. contributed $10,000. It funnels money to groups that make independent political expenditures — political action committees that can spend unlimited amounts of cash without disclosing where it came from. Virginia-based Annual Fund Inc, according to Bloomberg, primarily gives to a group called Citizens for the Republic, chaired by conservative media personality Laura Ingraham. Paxton’s statement said a legal exemption allowed him to accept out-of-state gifts from Annual Fund and the Gleasons. Whether the exemption applies is a matter of dispute. The Texas Ethics Commission last year narrowly voted against issuing an opinion that would have blessed the practice of raising legal defense funds outside of Texas. The commission’s move did not bar Paxton from claiming the exemption, but it leaves him open to potential challenges. Paxton was indicted on charges of securities fraud in 2015. He is accused of misleading investors in a company from before his time as attorney general, and if convicted, he could face up to 99 years in prison. He pleaded not guilty. Paxton has beaten a similar, civil case at the federal level and is awaiting a trial date in the remaining case, which kicked off last week in Harris County under a new judge. Both sides are due back in court July 27 to continue discussing a potential schedule. Paxton's defense team contains some of the state's top legal talent, and his legal tab is expected to reach millions of dollars. Craig McDonald, director of the liberal watchdog group Texans for Public Justice, suggested Paxton was “exploiting” the gift loophole. TPJ filed the initial complaint that led to Paxton's indictment in 2015. “The Attorney General is supposed to enforce the law, not stretch it. It's good to have 'friends' when you need help to stay out of jail,” McDonald said in an email. Patrick Svitek and Andy Duehren contributed to this report.